When I wrote this 4 years ago this “piped piper” was continuing to reach out to others – not only children but mentoring young adult women and sharing God’s Word. It has been a joy to see her become an ordained minister and now she begins a new adventure as a pastor. Wonder how much her experience in the Philippines has led her to this new role in life. Congrats and God’s best to my “Piped Piper” as she continues to share God’s love with others. What happens when you take an American teenager away from her comfortable home and set her down in a totally unfamiliar environment? That was the question my husband and I faced when our youngest daughter was 15. 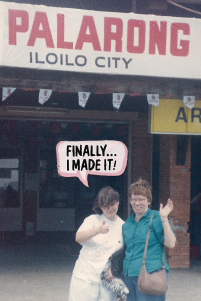 We had a chance to move to the Philippines and teach at a local Bible school in Iloilo City. While we were excited about the opportunity, we had worries about the effect this would have on our daughter. At the age when most teenagers are looking forward to receiving their driver’s license, having their first date and going to the prom, she would have to crowd all her personal effects into two suitcases and say goodbye to friends and the comfortable life she had known. While she never complained, it was a scary and difficult move for her. God has and will continue to use her in mighty ways!